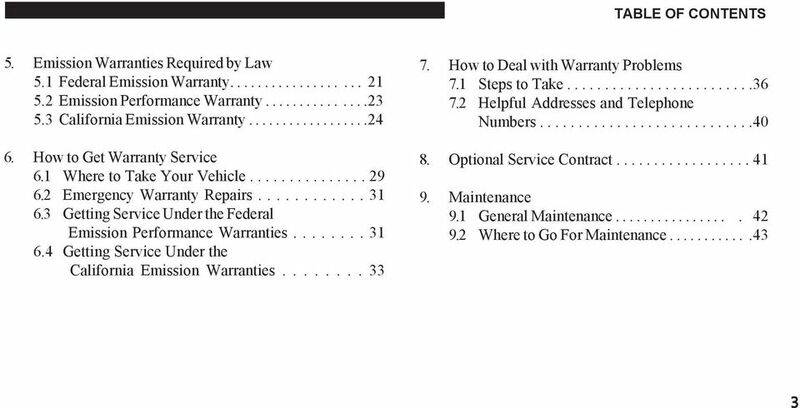 Download "WARRANTY COVERAGE AT A GLANCE"
4 4 LEGAL RIGHTS 1. 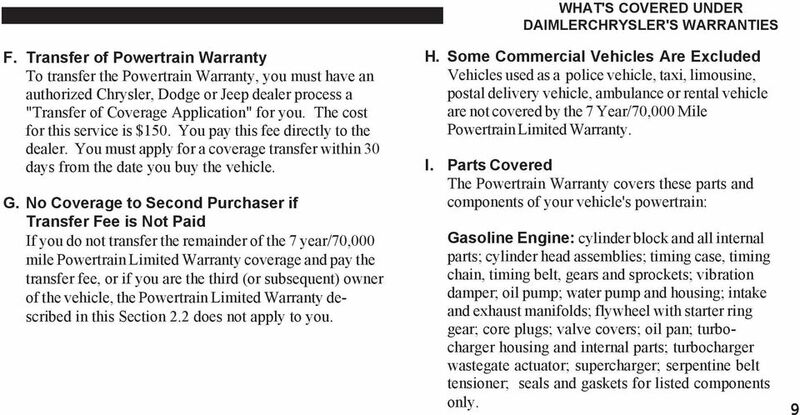 Your Legal Rights Under These Limited Warranties The warranties contained in this booklet are the only express warranties that DaimlerChrysler Motors Company LLC ("DaimlerChrysler") makes for your vehicle. 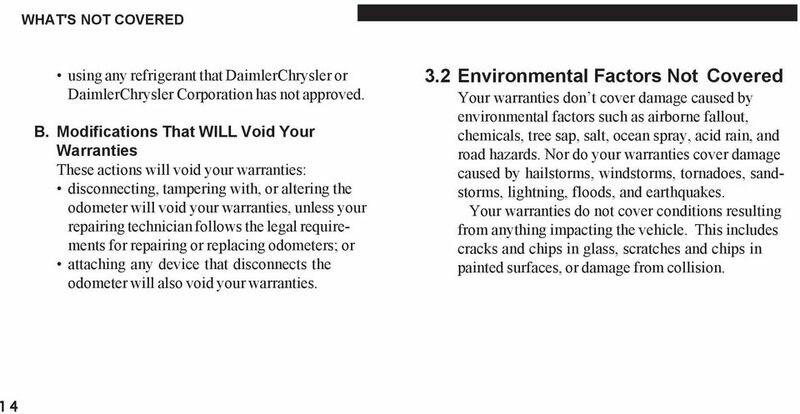 These warranties give you specific legal rights. 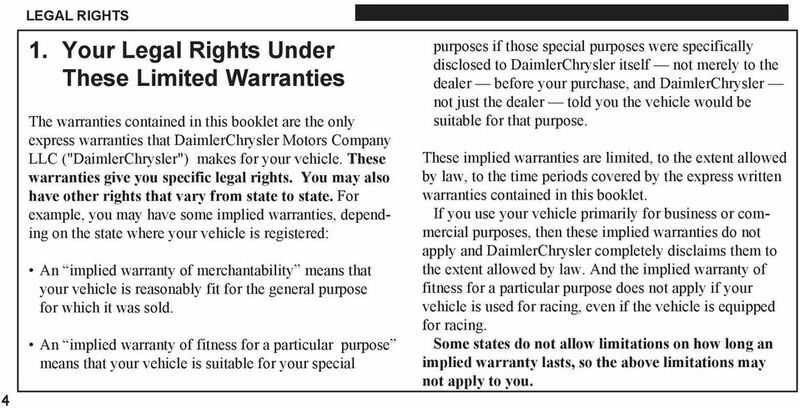 You may also have other rights that vary from state to state. 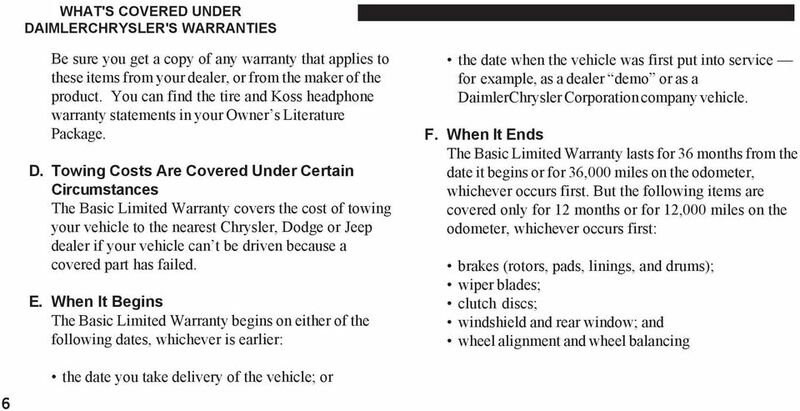 For example, you may have some implied warranties, depending on the state where your vehicle is registered: An implied warranty of merchantability means that your vehicle is reasonably fit for the general purpose for which it was sold. 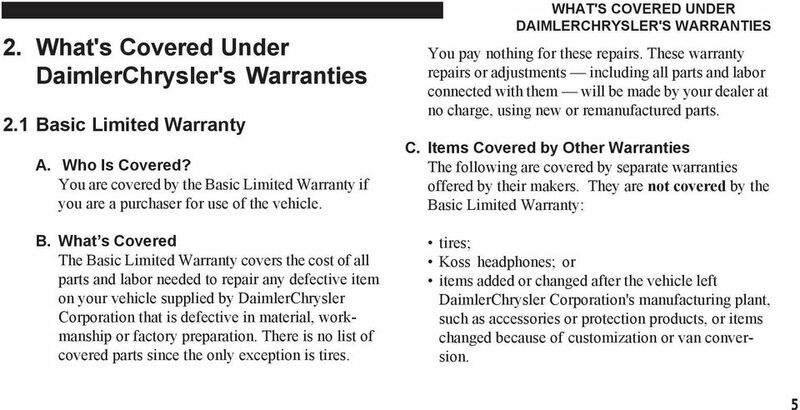 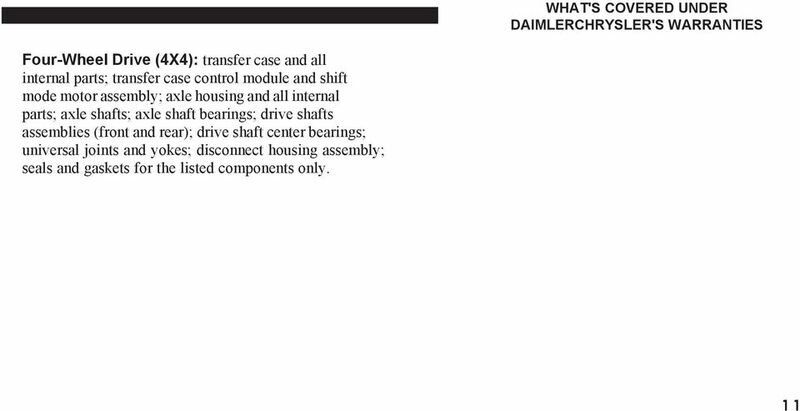 An implied warranty of fitness for a particular purpose means that your vehicle is suitable for your special purposes if those special purposes were specifically disclosed to DaimlerChrysler itself not merely to the dealer before your purchase, and DaimlerChrysler not just the dealer told you the vehicle would be suitable for that purpose. 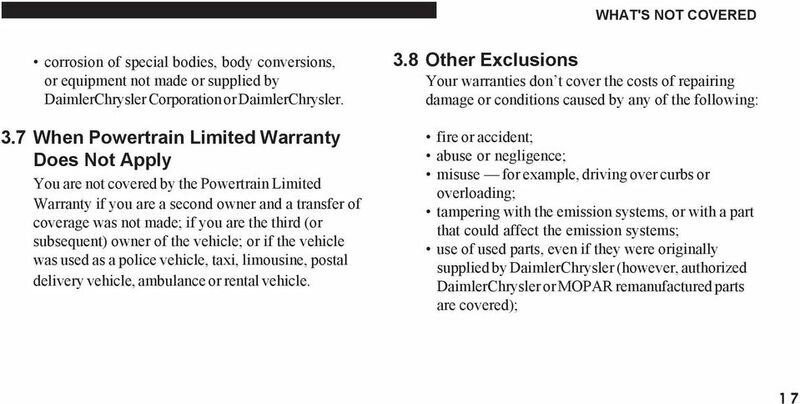 These implied warranties are limited, to the extent allowed by law, to the time periods covered by the express written warranties contained in this booklet. 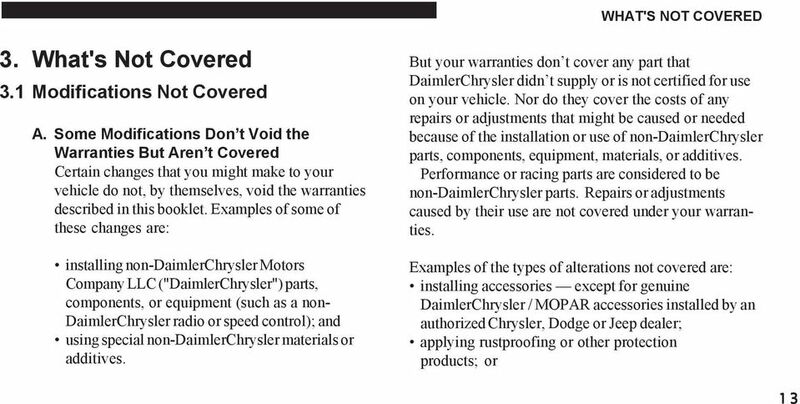 If you use your vehicle primarily for business or commercial purposes, then these implied warranties do not apply and DaimlerChrysler completely disclaims them to the extent allowed by law. 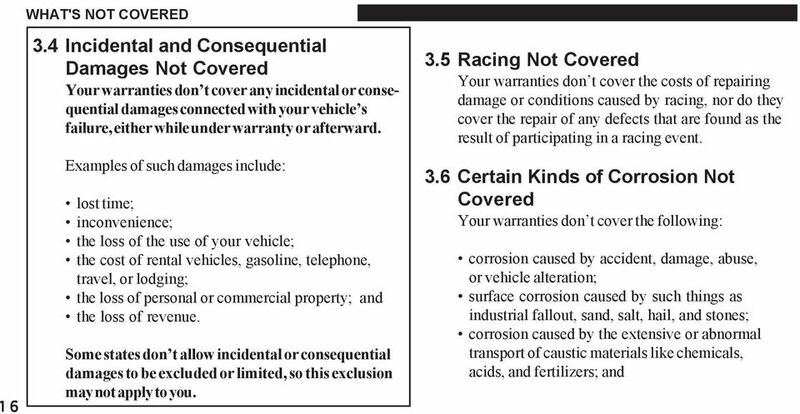 And the implied warranty of fitness for a particular purpose does not apply if your vehicle is used for racing, even if the vehicle is equipped for racing. 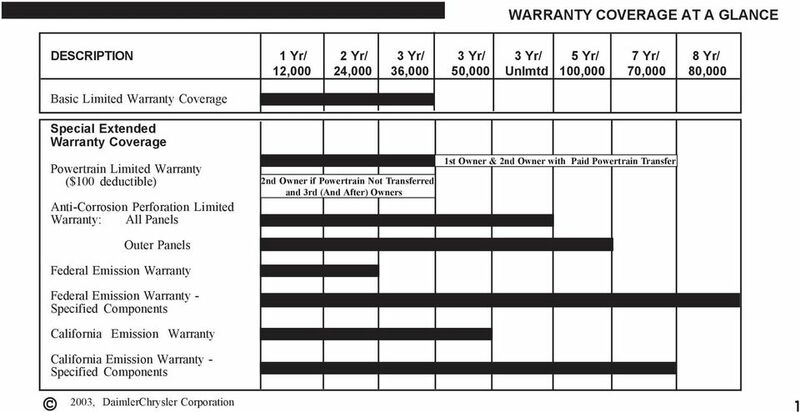 Some states do not allow limitations on how long an implied warranty lasts, so the above limitations may not apply to you. 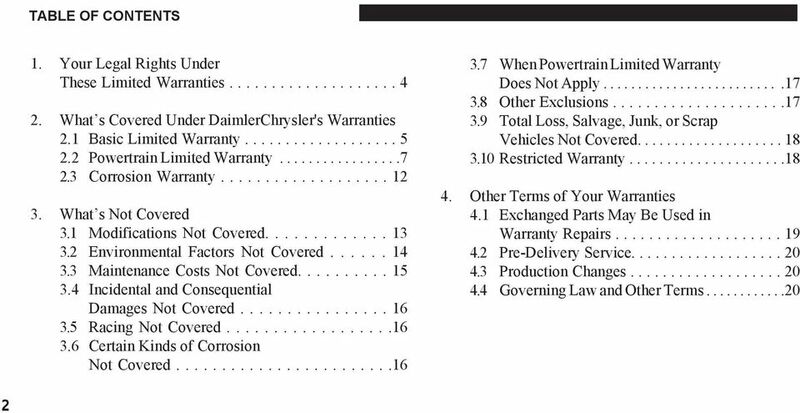 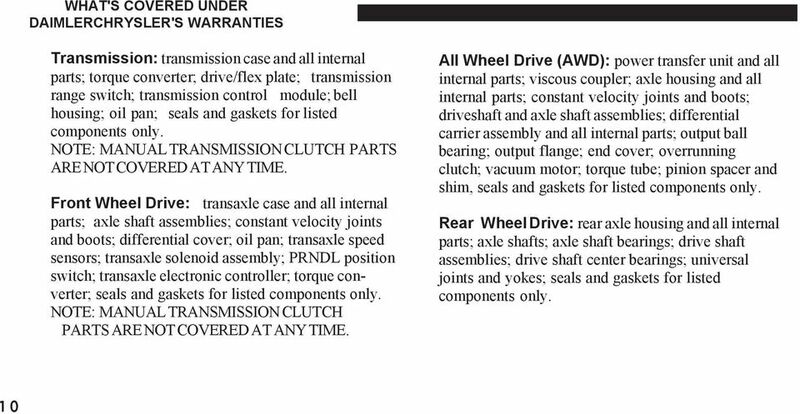 WARRANTY INFORMATION 2013 All Vehicles IMPORTANT This booklet contains Chrysler Group LLC limited warranties. 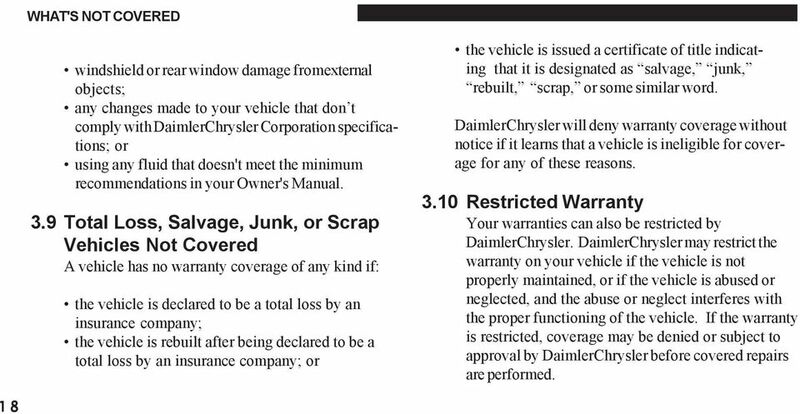 It should be kept in your vehicle and presented to your Dealer if any warranty service is needed. 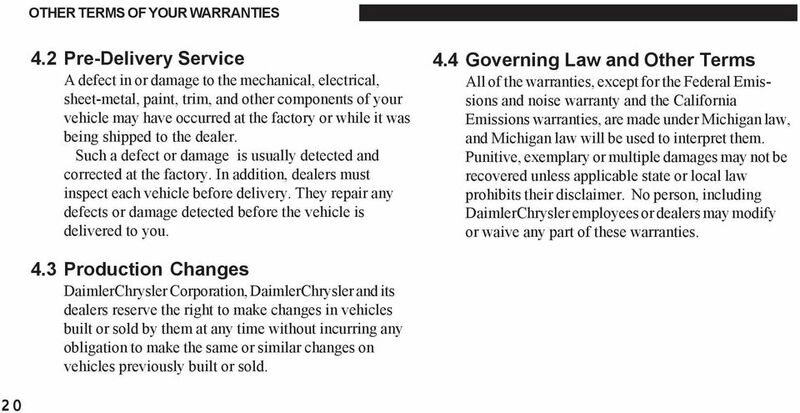 WARRANTY INFORMATION 2014 All Vehicles IMPORTANT This booklet contains Chrysler Group LLC limited warranties. 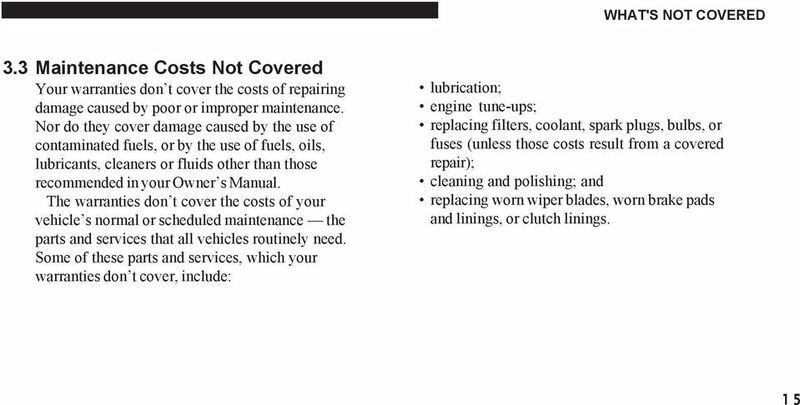 It should be kept in your vehicle and presented to your Dealer if any warranty service is needed. 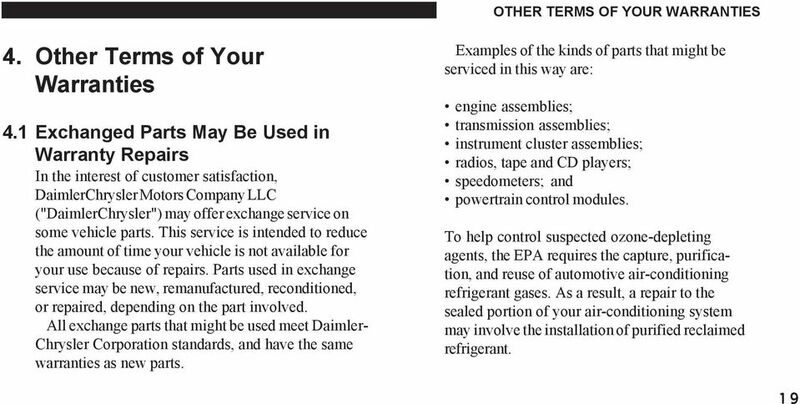 CONTENTS TO OUR CUSTOMERS: THIS BOOKLET SHOULD BE KEPT IN YOUR VEHICLE. 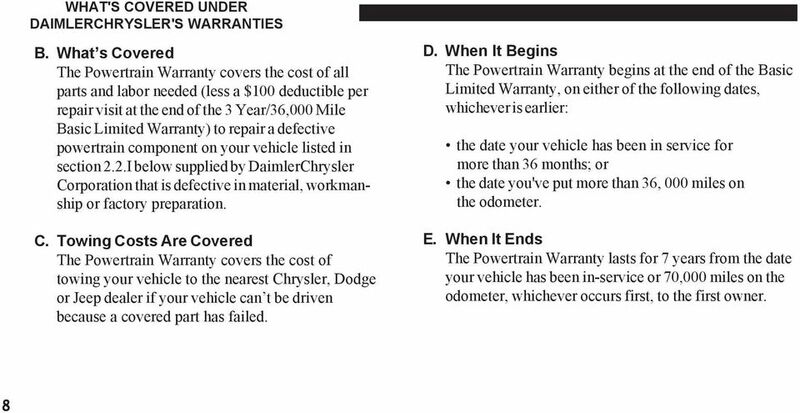 IMPORTANT: This booklet contains important information about the vehicle's warranty coverage. 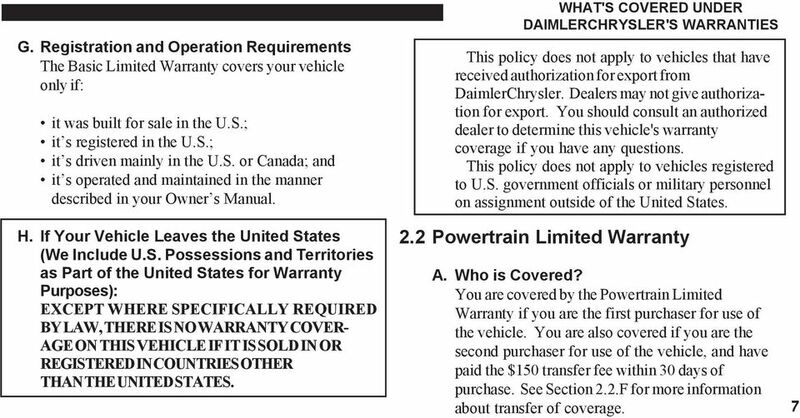 It also explains owner assistance information and GM's participation in an Alternative Dispute Resolution Program. 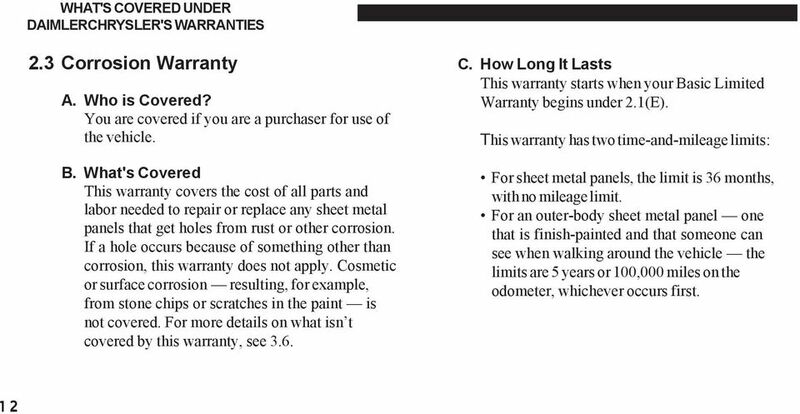 BE TOTALLY CERTIFIED WITH YOUR PURCHASE.